Facing criticism from South Australians ranging from a Port Pirie pensioner to doctors and heavyweight union representatives, Treasurer Rob Lucas today began the battle to sell his first Budget. While broadly welcomed by business and some industry sectors, notably property and construction, the subjects of Lucas’s scalpel today began gearing up for likely long-term campaigns against the cuts and privatisations that the Treasurer says are necessary to clean up the fiscal “mess” left by Labor. The trickiest moment came on ABC Radio Adelaide, with talkback caller Trish confronting Lucas about the pain she says she will bear from his decision to increase Housing Trust rents for some tenants by an extra $10 a week. Trish, described as a pensioner from Port Pirie who lives in a one-bedroom Housing Trust flat, said she would struggle to pay the extra $10, given her total fortnightly grocery budget was $60. “I live pension to pension mostly – it’s not like there’s a huge amount left over. I just don’t know where it’s going to come from,” she said. Lucas responded that his decision was difficult, but fair, and encouraged Trish to seek assistance from “the various government departments and agencies”. At the other end of the pay scale, Lucas is facing a fight from doctors who work in the public health system, after his Budget announced increased fees for salaried medical officers who operate private practices within public hospitals. Anticipating the battle, the Treasurer yesterday pointed out that 290 salaried medical officers in the system earned more than $500,000 in 2017–18. Today, the South Australian Salaried Medical Officers Association (SASMOA) stood alongside Opposition Leader Peter Malinauskas and other sector leaders to oppose the change and the potential privatisations of Pathology SA and SA Medical Imaging – also flagged in yesterday’s Budget. SASMOA spokesperson Bernadette Mulholland said she feared the potential privatisations – threatened if the two organisations don’t hit savings benchmarks – would be the beginning of a broader outsourcing agenda in health. “We are very concerned that this is the beginning of our future and that this is an agenda that this government will continue to use to privatise our health services,” she said. She also feared the fee hike for private practice would lead to doctors leaving the public system. 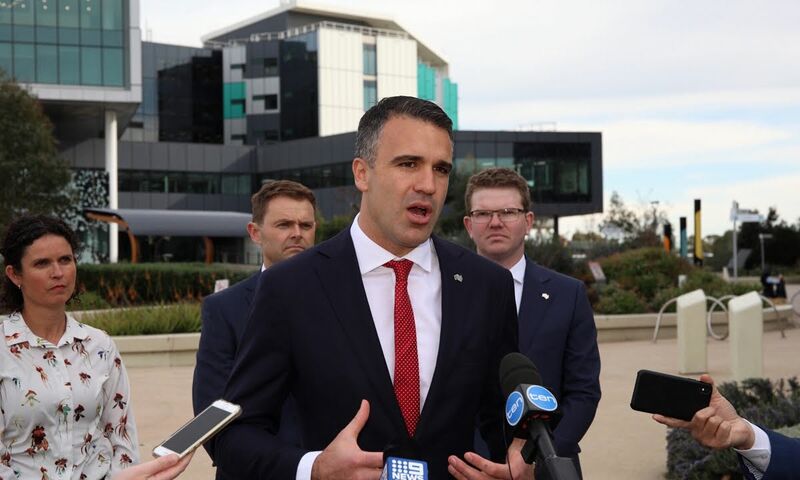 Malinauskas echoed the concerns about the potential privatisations which he said could “fundamentally erode the public nature of our public hospital system”. “South Australians didn’t invest over $2 billion of their own money into the Royal Adelaide Hospital to only see privatisation of services that operate within it. “Public hospitals, public health systems should remain in public hands to deliver to service to the whole of our community, rather than a select few who are able to afford it in the private system. Sarah Andrews, from Professionals Australia which represents scientists, technical officers and medical physicists, described the potential privatisations as “dangerous for the community”. “When you put profits before people, particularly in the health system, you lead to poorer outcomes for patients,” she said. “Medical scientists and technical officers working in SA Pathology currently do the most complex work in this state. They do this not only because they’re highly skilled and trained, but also because the private sector currently sent them this work. “When the private sector is obliged to do this work, who is going to pay? “What we’re going to see is patients having increased health bills due to privatisation. What we also expect is that tests will be sent interstate for diagnosis. That means that patients will be waiting longer for treatment. The Government also faces a torrid campaign from the powerful Public Service Association in response to proposed cuts to public service numbers, including a headline reduction target of 4000 jobs, a 10 per cent cut to SA Health’s head office, and the privatisation of the Adelaide Remand Centre. The PSA is currently analysing the Budget, but it is particularly concerned about the remand centre decision, given how many of its members work there and also staff city watchhouses under the auspices of the remand centre. “The Government had a choice to adequately budget for community services that all South Australians require, but instead has chosen to re-use the negative rhetoric reserved to attack and cut hard working South Australians at budget time,” the PSA said in its initial Budget response. Lucas was unperturbed by the opposition this morning, arguing that some in business believed he should have gone further in his cuts while the PSA had been critical. “I think it is a fair judge if you’re being attacked from both ends, that you’ve probably got the balance reasonably right,” he told radio station FIVEaa. “I think there’s going to judgement from a lot of people. “This is a responsible budget. Ultimately, there’s some tough and difficult decision that have had to be taken.